There are several new Grocery offers from SavingStar available from today. 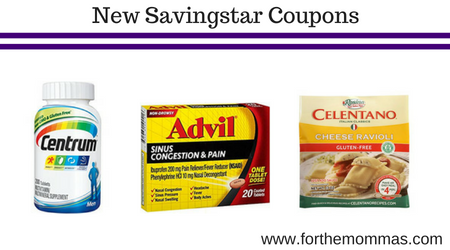 You can save up to $30.00 on Advil, Celentano, Nexium and More with the newest SavingStar offers. Save $2.00 off ANY Advil® Sinus Congestion & Pain, Advil® Allergy & Congestion Relief or Advil® Multi-Symptom Cold & Flu product..Expires 9/2/2018.Save $2.00. Save $2.00 off ANY ONE (1) Alavert® product..Expires 9/2/2018.Save $2.00. Save $2.00 off ANY ONE (1) Emergen-C® 8ct or larger..Expires 9/2/2018.Save $2.00. Save $2.00 off any ONE (1) Advil® product 20ct or larger, or ANY Advil® PM product 20ct or larger (including Migraine)..Expires 9/2/2018.Save $2.00. Save $2.00 on ANY ONE (1) Dimetapp®, Children’s Robitussin®, or Children’s Advil®..Expires 9/2/2018.Save $2.00. Save $2.00 on ANY ONE (1) Caltrate® product..Expires 9/2/2018.Save $2.00. Save $2.00 on ANY ONE (1) ThermaCare® product..Expires 9/2/2018.Save $2.00. Save $1.00 on any ONE (1) Purex® Liquid or Powder Detergent (any size)..Expires 8/26/2018.Save $1.00. Save $2.00 on any ONE (1) Nexium® 24HR product..Expires 8/26/2018.Save $2.00. Save $1.00 on any ONE (1) Celentano® Pasta Product..Expires 11/1/2018.Save $1.00. Save $2.00 on any ONE (1) Whole Earth® Sweetener Product..Expires 9/30/2018.Save $2.00. Save $2.00 when you buy any ONE (1) Persil® ProClean® Laundry Detergent. (Excludes 6 Loads or Less Trial/Travel Sizes. ).Expires 9/15/2018.Save $2.00. Save $2.00 when you buy ONE (1) FiberCon® product..Expires 9/10/2018.Save $2.00. Save $2.00 on ANY ONE (1) PREPARATION H® product..Expires 9/10/2018.Save $2.00. Save $2.00 on ANY ONE (1) Adult Robitussin®..Expires 9/9/2018.Save $2.00. Save $2.00 when you buy ANY ONE (1) Anbesol® Product..Expires 9/2/2018.Save $2.00.